Every new parent knows that choosing a stroller for their newborn is one of the most important purchases they will make. They also know that there are endless options and factors to consider. The pressure to get this pricey purchase right the first time is certainly tangible! To help ease some of that pressure, we’ve put together a comprehensive guide to aid in your search for the perfect bassinet stroller. 2.1 What Questions Should You Ask When Buying a Stroller? 2.2 What Is a Bassinet Stroller? 2.4 What Are the Benefits to a Bassinet Stroller? 2.5 What Features Should a Bassinet Stroller Have? 4.0.1 Q: Is a bassinet stroller necessary? 4.0.2 Q: Can I substitute a standard bassinet for my stroller’s bassinet? 4.0.3 Q: When should I stop using a bassinet? 4.0.4 Q: Are bassinet strollers safe? Here are our top picks for the best five bassinet strollers. UPPAbaby Vista made the list for being a tried and tested versatile stroller option. The Vista is a convertible stroller that will grow with your baby from birth all the way to your third child. Its rather minimalistic design does more than one might think at first glance and it includes a number of features that make it an ingenious workhorse. 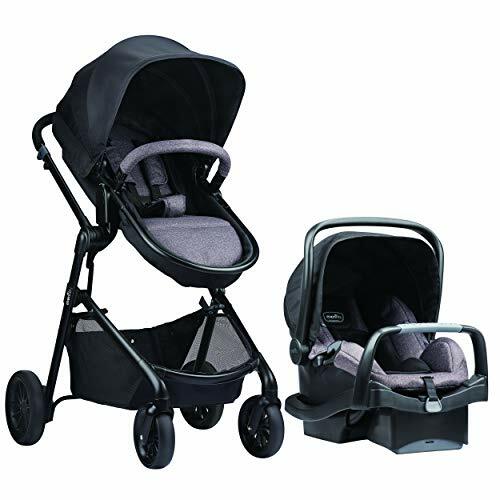 You’ll be comfortable strolling with your baby, and the Vista will keep baby safe and warm on your outings. It comes with a rain shield and bug shield, as well as an adjustable peek-a-boo canopy that allows you to see your baby while strolling. One feature we like is that the sunshade is UPF 50+, so your baby will be well protected from the elements. The bassinet liner is attached via a zipper and can be removed easily, which makes cleaning up spills and other messes easy. The Chicco Urban Stroller is a mid-range option that will grow with your baby. It is a 6-in-1 system that offers six “riding modes” to take you from birth to your child’s toddler years. This stroller accommodates children up to 50 pounds and weighs in at 26 pounds. It comes with an adapter that accommodates the Chicco KeyFit Car Seat, though the car seat itself is sold separately. You can move the seat to three positions: upright, reclined, and flat. You can also decide whether you want to have the seat facing toward you or away from you, a feature that is fantastic for children who like to see their surroundings when they go for walks. 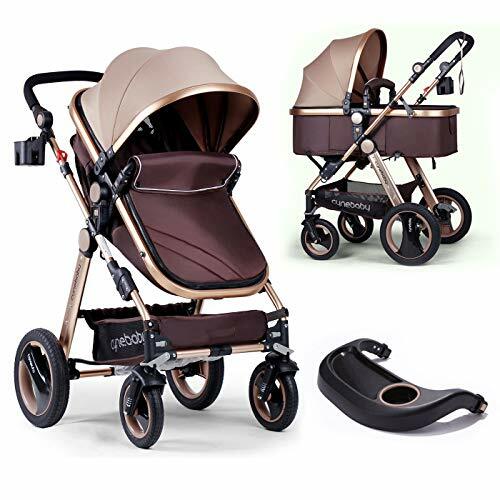 The Chicco Urban Stroller is a great economical choice for parents who don’t want to break the bank but are still looking for a high-quality stroller to last them several years. 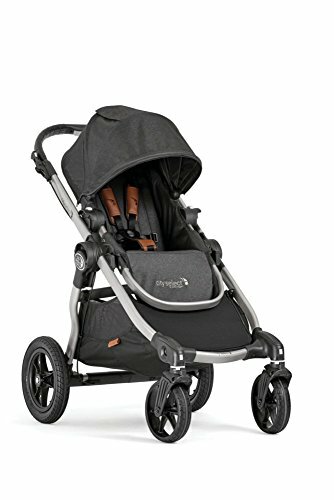 The Evenflo Pivot Modular Travel System is similar to Chicco’s Urban Stroller in that it too is a six-mode system designed to go where you go. Unlike other strollers, this one comes with a car seat and lock in base. The six different seating modes allow you to stroll however you want. The toddler seat converts to a bassinet, which you can face out or in as you please. You can also use the infant car seat in the stroller. The Evenflo Pivot Modular Travel System is an excellent value for your money. Evenflo has designed a product that is high quality, long lasting, and will grow with your baby. The great thing about it is that it doesn’t cost a fortune, which makes it an accessible option for many families. The Baby Jogger City Select Single Stroller is an excellent stroller for growing families. 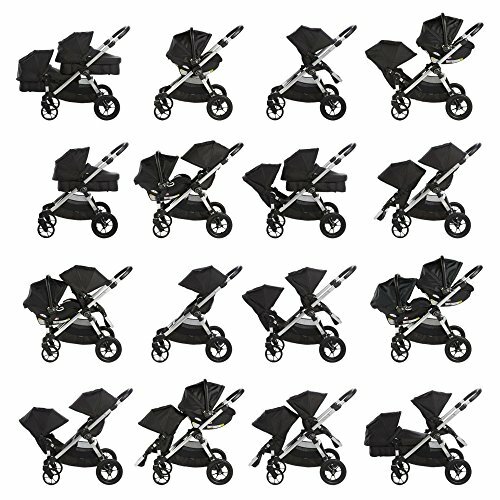 Versatility is the name of the game with this stroller, which provides you with 16 unique seat combinations that can accommodate up to three children. You can customize this stroller pretty much any way you need to by making the seats, which convert from a bassinet to a standard carrier, forward or rear facing. When you’re ready to bring home baby number two, the double conversion kit (sold separately) will easily add a second seat. The stroller is compatible with a number of car seats, and many parents report that it is incredibly easy to push. 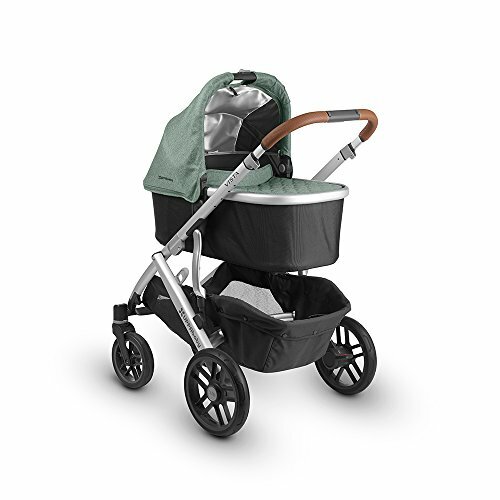 The Baby Jogger City Select includes a peek-a-boo canopy with UPF 50+ protection for sunny days and a seat that can be adjusted for children of different heights. This stroller will be a real MVP in your family and can accommodate your kids until they weigh 45 pounds. 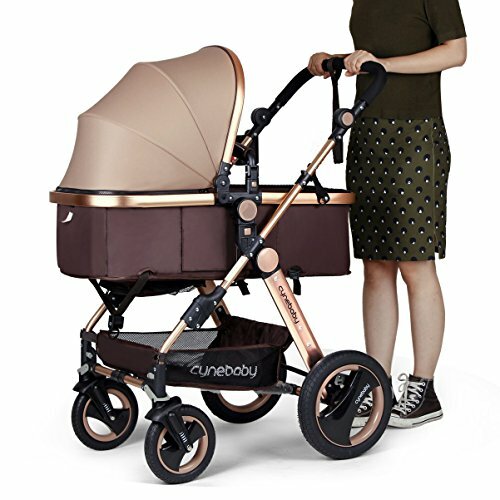 For fashion-forward parents looking for a stylish stroller, Cynebaby offers a gorgeous convertible bassinet stroller. This stroller isn’t just good looks—it’s well priced and can carry your child until they are 36 months old. You can start using it as a bassinet, and when your baby is a bit older, the bassinet converts to a regular seat. Whichever mode you use allows you to position the baby facing you or facing out. Cynebaby uses eco-friendly, non-toxic, and anti-bacterial materials in its strollers, a plus for parents concerned about having those types of materials in close contact with their baby. It’s easy to use this stroller on most types of terrains, and your baby will be safely locked into the 5-point safety harness. Plus, parents of differing heights will have no problem adjusting the telescopic handlebar to their preference. A stroller is not only one of the essential items you’ll buy for your newborn, but also it’s one of the most expensive. There are a lot of things to consider when deciding how to transport your newborn. Here’s everything we recommend keeping in mind before purchasing a bassinet stroller to help you get the most bang for your buck. What Questions Should You Ask When Buying a Stroller? You’ll want to ask a number of questions before deciding on a stroller. The more realistic you can be about your lifestyle and what you’re hoping to get out of the stroller, the more satisfied you will be. How long will we be using this stroller? Will we be using it in the car? Does this stroller have the storage we need? Can we move it with ease? Is there another child in our future? How do we need our stroller to address that issue, if at all? How heavy a stroller can we handle? What kind of weather will the stroller have to deal with? You may find as you search that you have even more questions, but these are some good basics to keep in mind as you look and read online reviews. What Is a Bassinet Stroller? Designed for babies from 0-6 months old, a bassinet stroller is a baby carrier on wheels. They are made to keep your baby warm and cozy when you take them out. Bassinet strollers allow your newborn to lie entirely on their back, which is vital since infants can’t hold their heads or sit up. The bassinet enables them to be in an optimal position for their ever-evolving motor development. Besides lacking the ability to support their weight, research tells us that if we want to keep babies safe, they should sleep on their backs. Putting them to sleep on their back reduces the risk of sudden infant death syndrome (SIDS). While the research is still unclear about why sleeping on their backs reduces this risk, there is a high correlation between sleep position and the likelihood of suffering from SIDS. Babies that sleep on their stomachs have a higher incidence of SIDS, so experts recommend never putting your baby to sleep on their stomachs in a bassinet. We advise doing more reading about how to keep your baby safe when sleeping and some common baby sleep and SIDS myths. What Are the Benefits to a Bassinet Stroller? This stroller does precisely what its name implies: it acts as a bassinet. Baby’s bed is mobile and can be removed from the stroller, which is extremely convenient when it comes to transporting—and not waking! —infants. Many strollers come with a bassinet apron, which is a type of blanket that covers about three-quarters of the bassinet. If your stroller doesn’t include this, it’s worth purchasing this item separately because it provides excellent protection from the elements and allows you to take your baby out even in cold conditions. Conversely, the bassinet is cool in the summer months as you can remove the apron and blankets. Baby can wear a fresh onesie and move unrestricted. Bassinet strollers also provide great storage for all of the things you’ll need when taking your baby out on the town: formula, diapers, and more can be stowed in the stroller. What Features Should a Bassinet Stroller Have? You’ll want to find a stroller that allows you to remove the bassinet easily. This is probably the most important feature, because you’ll need to remove the bassinet without waking your baby. If you can go and test this feature in person, we recommend doing so to ensure a great fit. Easy folding is another thing to consider. 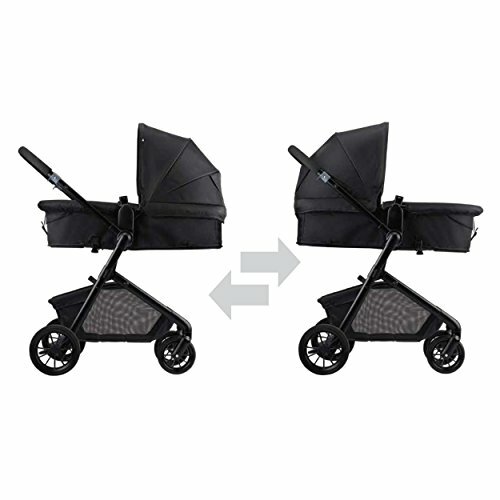 You will constantly be folding and unfolding your stroller when driving and coming home. Given how often you’ll be doing so, you don’t want to struggle to fold your stroller. Again, we recommend testing out this feature on any models you consider buying. Strollers can be folded using one hand or two, but any new parent will tell you that since your hands are always busy, a one-hand fold is better. The Holy Grail is a one-hand self-standing fold, which won’t tip over in your house when not in use. There are fewer options when it comes to sit and stand, especially for newborns up to six months. If this sounds like something you’re interested in, we’ve put together a list of the best sit and stand strollers for your money. Finally, a bassinet stroller should be lightweight enough to load and unload from your car. And while not a critical daily feature, detachable wheels are a lifesaver if you’re going on a long road trip and need every bit of extra space in your car possible. If you’re unfamiliar with any of the brands listed in our top 5, here’s some more information about them. Uppababy is a leader in baby products in the United States with more than three decades of experience. Their vision is to create fantastic-looking products that are fun and easy to use. An Italian brand that’s been around for more than sixty years, Chicco is a ubiquitous name in households across the United States. You’d be hard-pressed to find a parent with no baby gear from Chicco. Evenflo has been around for nearly the past century, making it the most long-lasting company on our list. They make a number of products for children including strollers, car seats, high chairs, and safety gates. As Baby Jogger’s name would suggest, this company got its start in 1984 designing jogging strollers. Since then, they’ve expanded beyond joggers to create strollers that can go wherever parents might want or need to go. Lastly, Cynebaby sells a wide range of baby products including strollers, car seats, baby carriers, baby mosquito nets, and raincoats. Cynebaby products are sold around the globe and are quite successful in several different continents. Another company worth mentioning is Bugaboo, famous for popularizing the first convertible stroller. 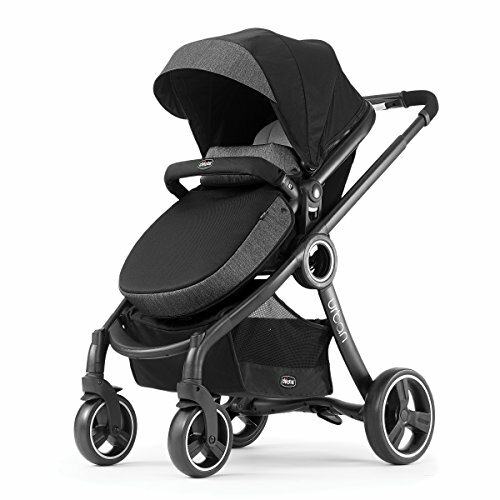 Bugaboo came onto the scene in 2005 and has since become a favorite luxury stroller brand among celebrities. Q: Is a bassinet stroller necessary? A: If you’re considering a convertible stroller that requires you to purchase the bassinet separately, you may be wondering if this item is truly necessary. 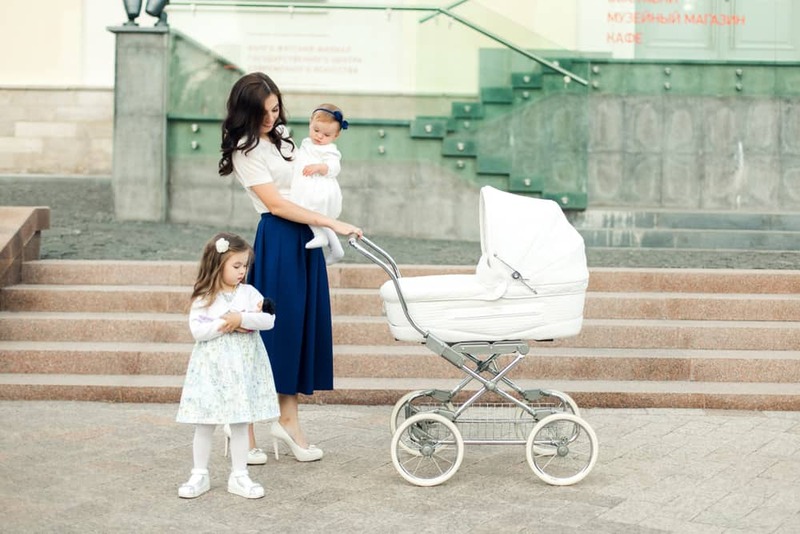 All strollers marketed for newborns will have the ability to lay the baby flat on their backs, so a bassinet is not necessary for the strict sense of the word. The decision to buy one or not comes down to personal preference. If you’re mostly going to be transporting your baby in the car, you may want to skip this item. Likewise, if you plan to use a harness or a carrier when you go out, the bassinet may not be for you. Plus, some parents will tell you that their baby just never liked being transported this way. Those who do use them find bassinets to be a great thing to have. They are useful for parents who spend a lot of time out and about strolling with their little one. Your baby can sleep comfortably and safely while you’re out doing errands or seeing friends. It’s also a convenient way to transport your baby if you’re spending a lot of time on foot. This is why city-dwellers make great use of bassinet strollers. Q: Can I substitute a standard bassinet for my stroller’s bassinet? A: Using your stroller bassinet for overnight sleeping is an excellent way to cut down on costs and save space in the house. Most parents simply place the bassinet on the floor next to their bed and take it with them as needed during the day. That said, not all stroller bassinets are designed for overnight use. 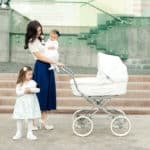 Whether or not you can use your bassinet in this manner will depend entirely on the stroller model you purchase, so you’ll need to check with the manufacturer. 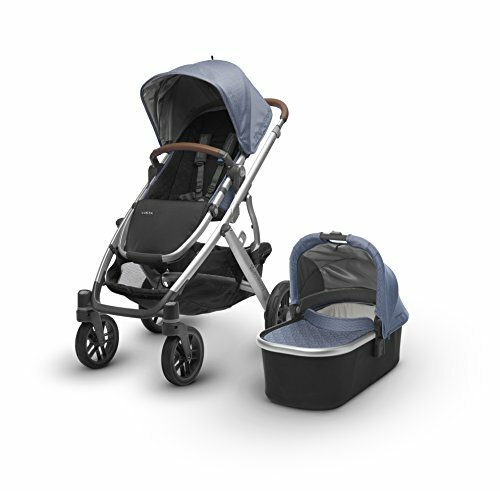 UPPAbaby is one example of a stroller that comes with a portable bassinet. This company even sells a bassinet stand. Q: When should I stop using a bassinet? A: Babies can use bassinets until they are anywhere from 4 – 6 months old. You should stop using yours once your baby can sit up, roll over, and move about freely. This is when the short exterior walls of the bassinet become dangerous for curious, ready to move infants. Once your baby starts getting mobile and can push themselves up on their hands and knees, it’s time to swap out the bassinet for an age-appropriate stroller seat. Q: Are bassinet strollers safe? A: Bassinets do not include safety straps or harnesses, so you might be wondering how safe they are. If used for newborns, as mentioned above, bassinet strollers are perfectly safe. This is because babies do not move independently and cannot climb out of the bassinet. While the bassinet itself is perfectly safe for babies, it’s important to mention that things like stuffed animals and blankets can be dangerous to newborns that might bury their heads in them. We recommend keeping a close watch on your sleeping infant if you use blankets in their bassinet, or skipping the blanket entirely in favor of a wearable blanket sleeper or sleep sack. After carefully reviewing the top 5 bassinet strollers, our top pick is the Baby Jogger City Select Single Stroller. This stroller indeed offers a fantastic amount of features for a great price. We especially love that it does the same things as some of the more expensive convertible strollers. 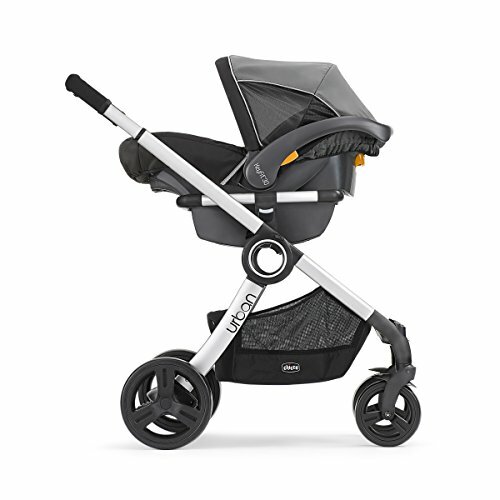 The Baby Jogger City Select is easier to handle and moves better than the UPPAbaby Vista. It’s also hard to ignore the numerous positive reviews on Amazon, which made it a standout in our opinion. It holds its own against the UPPAbaby Vista when it comes to customer ranking. Furthermore, the issues parents experienced with this stroller were all relatively minor—the stroller could include storage items like drink holders, and some users complained that it was a bit heavy with two children, which is to be expected. You can purchase the Baby Jogger City Select here.